After nearly five hours exploring the immense cathedral in Sevilla, Karen and I emerged into its large cloister, known as the Court of the Orange Trees when a mosque occupied the site over six hundred years ago. A lovely citrus grove still provides pools of deep shade in the bright Andalusian sunlight, and at its very center stands the round fountain where medieval Muslims cleansed hands, face and feet before going inside to pray. Making impromptu homage to this ancient practice, we removed our shoes and sank our feet into the cool water. It wasn’t long before a cathedral guard hurried over to tell us this was forbidden. “Malo!” she said, pointing to the fountain. The water didn’t appear toxic, so we assumed it was not the water that was bad, but the fact of bathing our feet. Stepping out of the water, we picked up our shoes and started walking toward a bench where we could put them on more easily. No, no, no, she said, indicating that we were not allowed even to walk on the courtyard bricks in bare feet. We don’t speak Spanish, but we gathered that it was deemed disrespectful to go barefoot on church property, even outside the walls of the worship space. Though there is ample precedent for bare feet as the preferred option for standing on holy ground, that was clearly an untranslatable argument in this particular instance, so I stooped over to pull on my Keens. At that point another cathedral official, a man who spoke English, came to see what all the fuss was about. He explained that we were in a church, not a park. I replied that we meant no disrespect, and that in fact footwashing, even in such a casual situation, always had a ritual dimension to it. His brow furrowed, and he gave us a scrutinizing look. “Are you Muslim?” he asked. So if I had been a Muslim when I dipped my feet into the water of a former mosque upon whose ruins a great church has been constructed, would I have been makings a symbolic challenge to the Reconquista, a small retaking of place lost so long ago? Or had I, even though a Christian, simply touched a wound still sensitive, still unhealed? I’ll never know for sure. The whole incident may have been nothing more than a matter of manners: they just don’t like bare feet on church grounds! 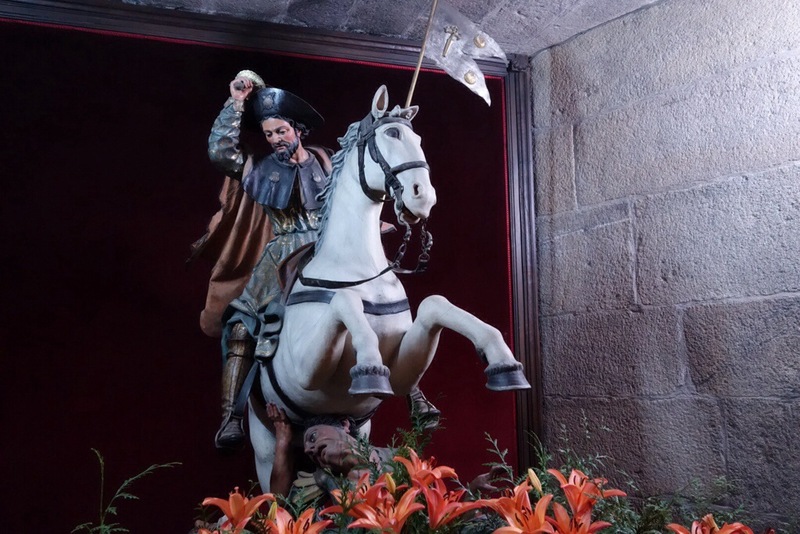 But having seen countless paintings and sculptures of Santiago Matamoros (“St. 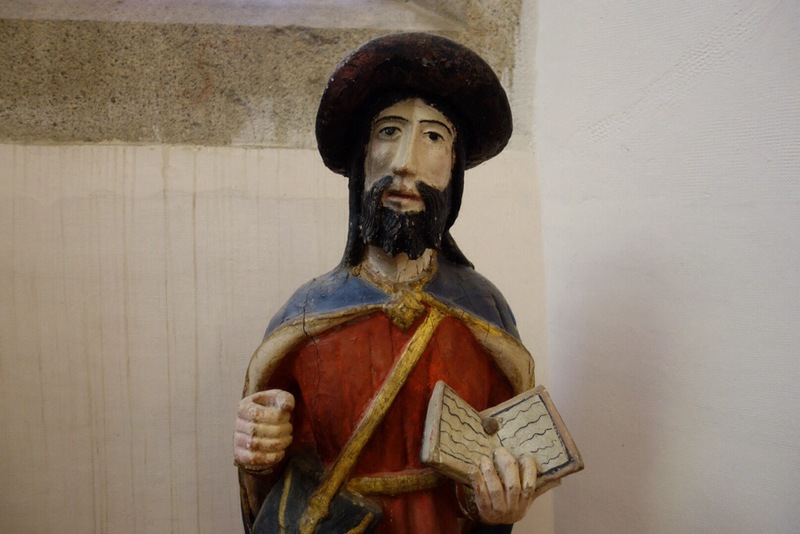 James the Moor-slayer”) in churches along the Camino de Santiago, I do wonder about the lingering significance of images which define cultural or religious identity at the expense of the “other.” All those depictions of Santiago as warrior were put up long ago, of course. 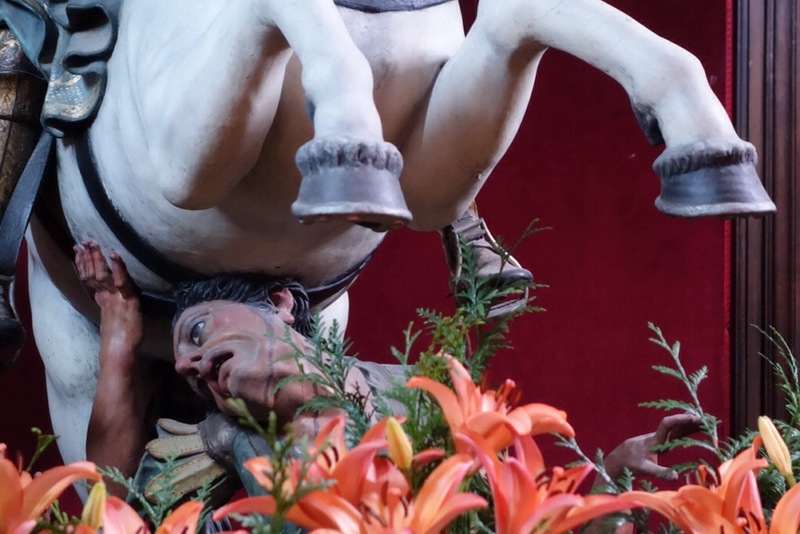 At the cathedral of Santiago de Compostela, they have attempted to hide the trampled Muslims behind big flowers, hoping to soften the disturbing iconography. Nevertheless, though I claim no expertise on Spanish history and identity, I did get a sense of something deep and unresolved in that official’s question at the fountain. How do I write an ending to the Camino? Certainly with no summary remarks, for such reductions would do disservice to the complex flavors of the journey. I feel like the pianist who was asked to explain the composition he had just played. Without a word, he sat down and played it again. 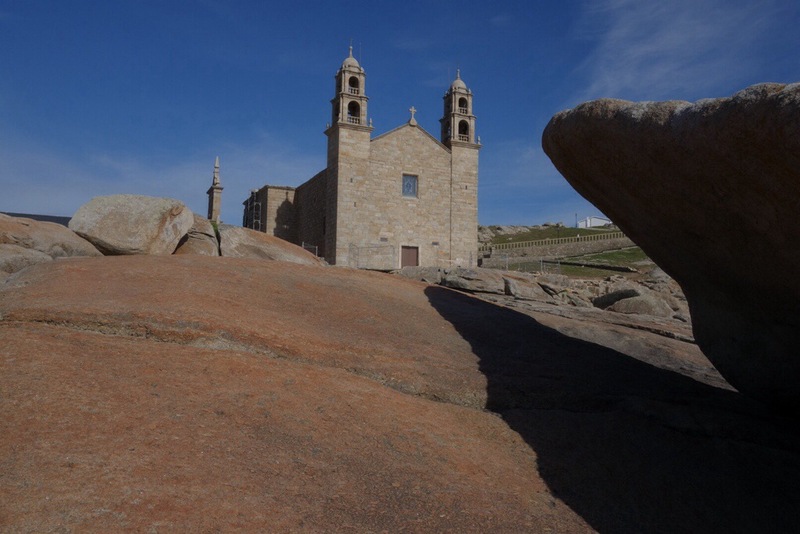 On Monday afternoon, I continued on from Santiago to Finisterre (“the end of the world”), an extension of the Camino that predates the Christian shrine at Santiago. For the ancient Celts, and many pilgrims since, the natural place to make an ending is where the land is swallowed by the sea and the sun disappears over the edge of the known. Some make this journey on foot (54 miles west from Santiago), but I, alas, took a bus, needing some rest for weary legs. Finisterre is a high headland with a charming harbor town, wild hills and dramatic shoreline. I made the obligatory walk to the lighthouse at the southern tip, where the last Camino marker reads 0.00 K, and pilgrims can leave or even burn a symbolic offering (shirts, boots, and walking poles were among the abandoned items). But the souvenir stand and tourist buses were not contemplative aids, so I took the spectacular trail along the western side, high above the sea, bright with yellow flowers, descending finally to an isolated beach. 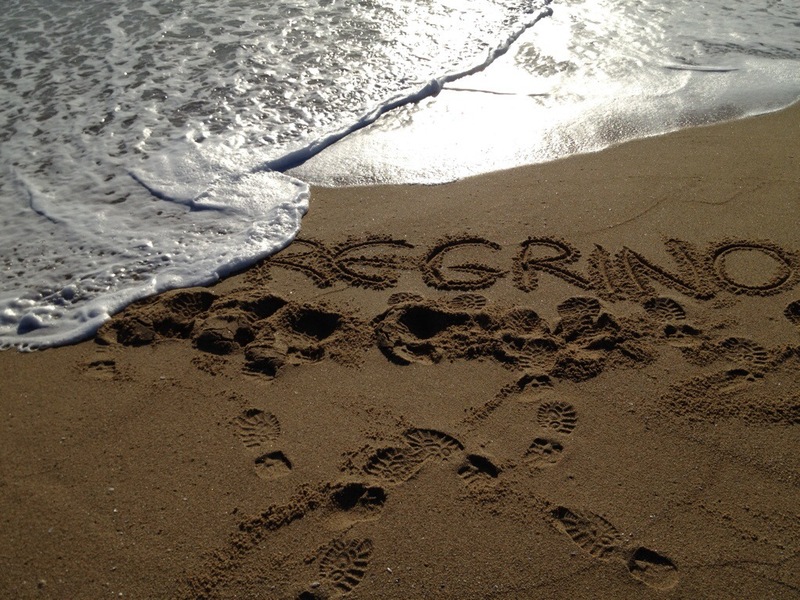 In my own act of letting go, I wrote PEREGRINO (pilgrim) in the sand, and watched the tide erase it. 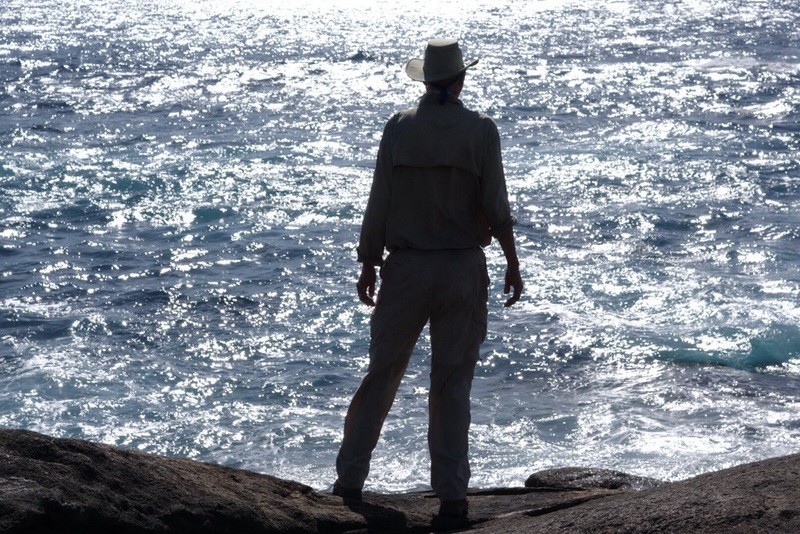 Then I climbed to the rocks on the cape’s highest point to watch the edge of the world erase the sun. 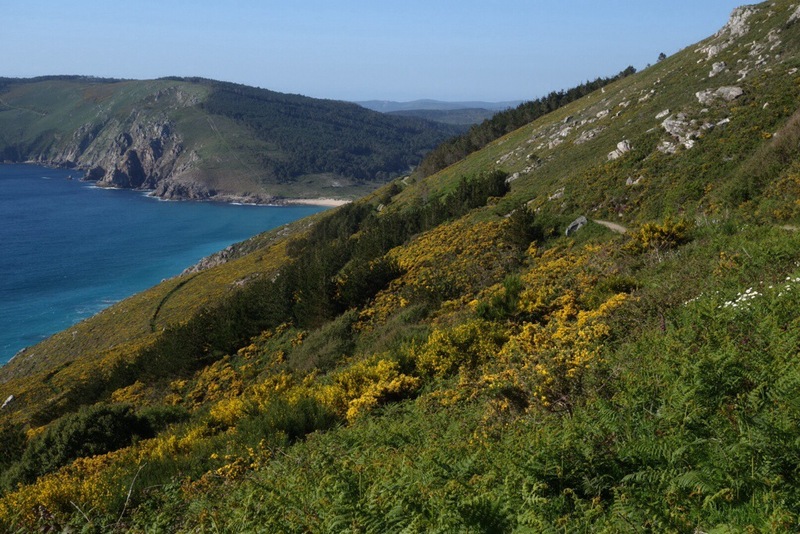 I still had one more walk to do, from Finisterre north to Muxia: 18 miles of pine and eucalyptus woods, pastures and crop land, remote stone villages, flowered meadows, an estuary brimming with fish, and white sand beaches. I wanted to make this final trek not only to make intimate acquaintance with a remote corner of Galicia, but also to end my Camino just as I had begun it – on foot. It was a hot and demanding day, but when I reached the fishing village of Muxia, I didn’t stop to shower or rest, but continued the final 800 meters to the furthest point, where massive stone slabs slide into the surf, and the Santuario da Virxe da Barca (Virgin of the Boat) faces the setting sun. Here my Camino came to an end. that Ithaca will offer you riches. set out on the road. 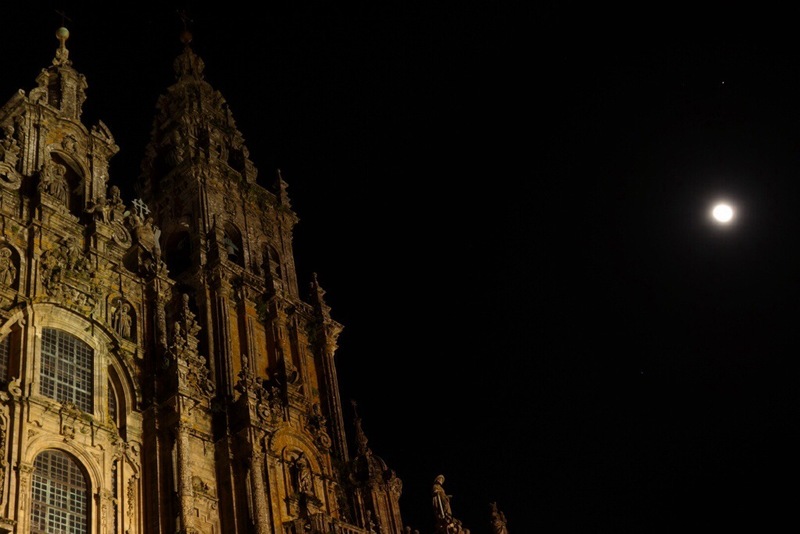 It was still dark Sunday morning when I first stepped into the Prazo Obradoiro – the wide plaza in front of Santiago cathedral. It was deserted but not silent. A taxi sat motionless in the far corner, idling its engine, waiting for what? After ten minutes it finally departed. The new day began to light the spectacular west facade, but one of its towers was hidden by scaffolding – had I walked 500 miles only to see its glory veiled? I had told myself along the way to have no script for this moment, no expectations for my journey’s end. But this first glimpse of the cathedral, if not exactly disappointing, was at least bewildering. Where were the tears of joy, the flood of emotions? The cathedral’s great bell struck seven, deep and resonant like the voice of a god, but in a language dark and alien, not addressed to me. Before the crowds arrived, I drifted around the quiet interior. 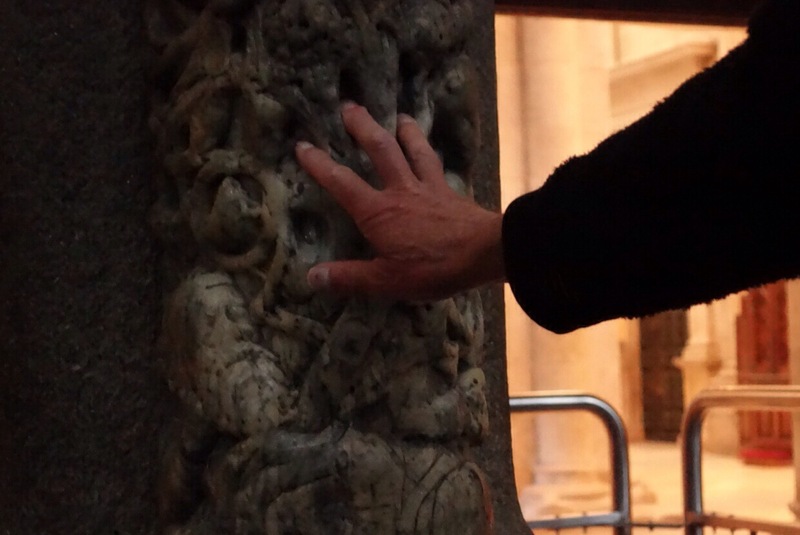 I placed my hand in the Tree of Jesse, the carved central pillar of the Portico de Gloria, my fingers sinking into the deep handprint left in the stone by the caress of countless pilgrims. I descended to the crypt to kneel before the silver casket containing James’ bones. But I was granted little sense of arrival or completion. Returning to the plaza, now bright with sunlight, I saw a large group of Portuguese pilgrims, singing, clapping and dancing in a great circle. “Resucito!” they sang. “Alleluia!” Many other pilgrims had joined this joyous perechoresis , and I did the same. 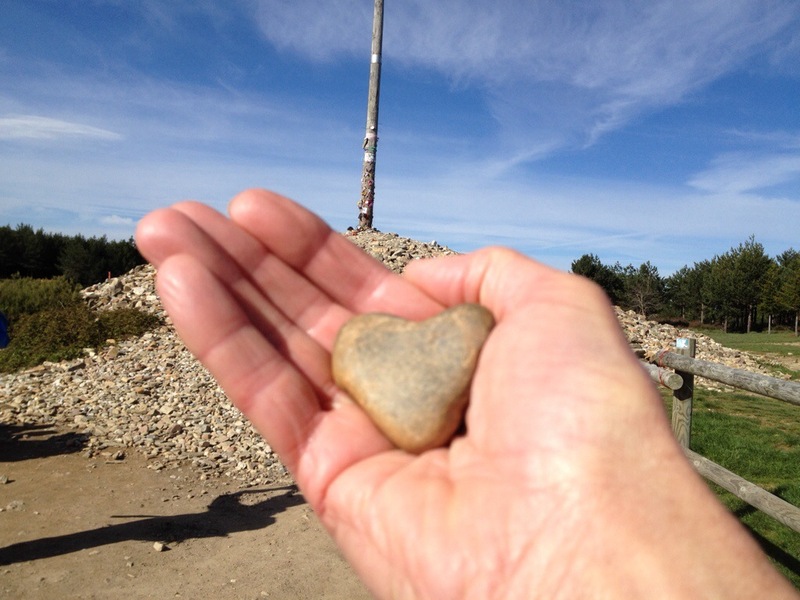 My heart began to lift, as I remembered – just in time – that the Camino experience is not a possession to be grasped, but a communion to be danced. Lord, I want to be in that number! 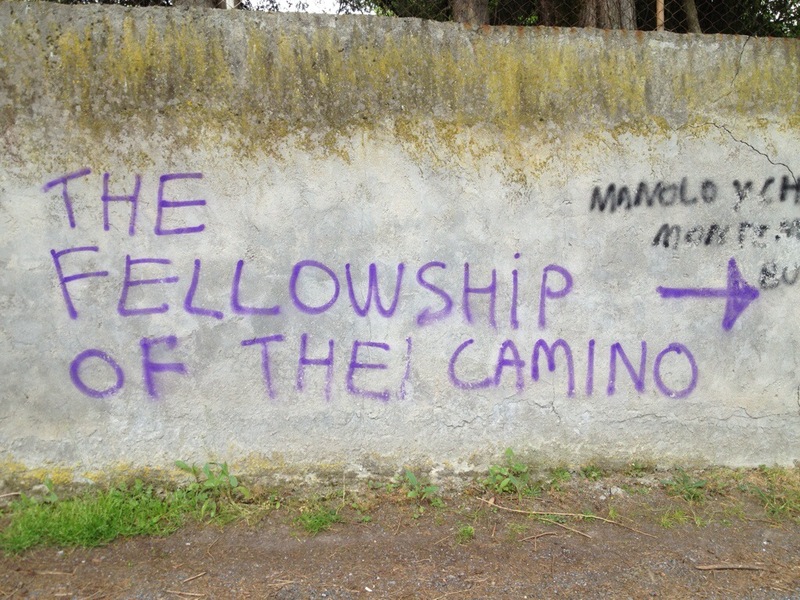 But as the day went on, my Camino still seemed unfinished. 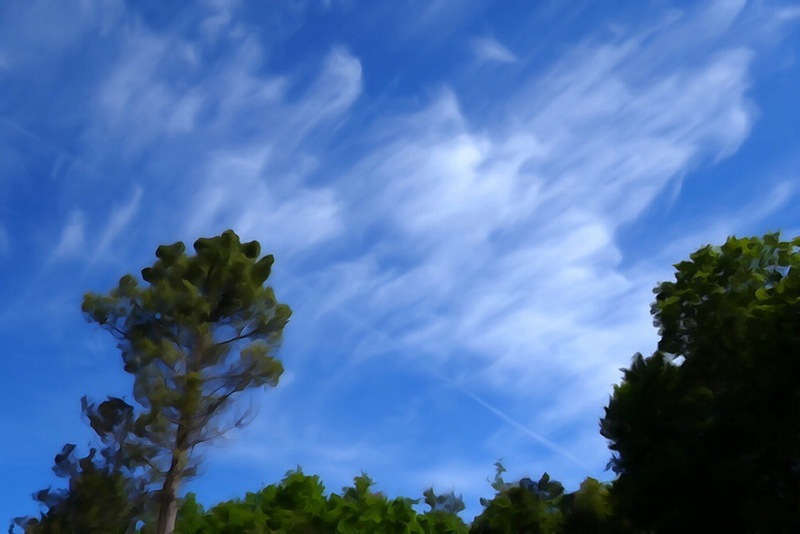 I felt rather disoriented, no longer walking toward certain goals, no longer sure how even to spend the afternoon. I went to the crowded pilgrim mass at noon, saw the celebrated “Botafumeiro” (gigantic thurible) swing back and forth between the transepts, exchanged “well done!” with a few pilgrims I recognized from the road. But most of my Camino family had either already arrived and departed, or were still a few days back. I felt a bit lonely. Late afternoon, I wandered over to the little visited San Martino Pinario, and walking inside felt like falling in love. Set amid its plain walls was the most breathtaking altar, a Churrigueresque ensemble of golden sculpture and ornamentation that worked emotionally in a way that so many baroque altarpieces do not. The declining sun streaming through it from behind intensified the effect. This was not mere showy theatricality, but an overwhelming physical presence that didn’t just symbolize belief. It created it. 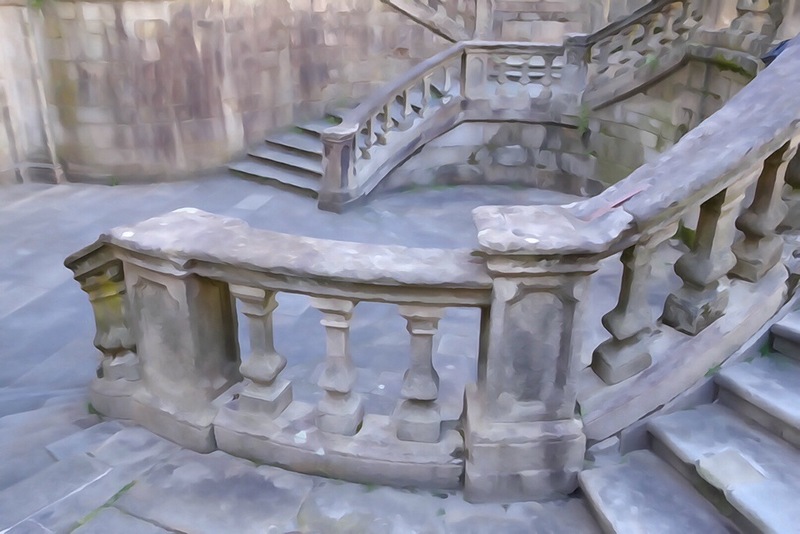 Back outside the church, I spent some time making camera studies of the fantastically dynamic staircase that leads down to the entrance from the street (an evocative reversal of the more typical ascent to holy places – here you descend to go deeper). And I suddenly realized I was happy. I would even call it a state of grace. I didn’t earn it, seize it, discover it. It discovered me. After that, it was enough to wander the old streets and plazas around the cathedral, noticing the pilgrim joy in the faces of strangers, enjoying the sense of celebration that is perpetual in this city of arrivals. I dined with some companions of the road before ending the day as I had begun it, in the darkness of the Prazo Obradoiro. But now the moon shone down upon the ancient stones, and strains of Galician singers filled the air. What more could I ask? silently there my mind will fly. This is one of the many shape note songs I sang along the Camino. I also sang hymns for Holy Week and Easter, made every tunnel and underpass echo with Kyries and Alleluias, and on a few evenings when a guitar got passed around in a hostel, taught choruses from Steve Earle’s “Pilgrim” (“we’ll meet again on some bright highway, songs to sing and tales to tell”) and Tom Russell’s “Guadalupe” (“I am the least of all your pilgrims here, but I am most in need of hope”). And several times a day I would break out with “Dum pater familias,” the medieval Latin song for St. James that rallied the spirits of the pilgrims who sang it as they walked. Prior to headphones, singing was an important part of the pilgrimage experience – shared voices imprinting the path with songlines. On my penultimate day, the words of “Parting Friends” are especially apt. My mind indeed flies back over the roads I’ve traveled and the people I’ve met. Previous posts have mentioned some of these, but let me record three more who have embodied for me the spirit of the Camino. The first is Janine, the hospitalera who welcomed me and six other pilgrims to a humble albergue in Calzadilla de los Hermanillos, a village lost in the vast Meseta like a small boat adrift at sea. In a place forgotten by time and history, this grandmotherly woman provided the most exquisite hospitality, as if we were her own family. The next morning, she saw me off with a blessing. Pointing to her “corazon” and mine, she indicated that we were connected. Then she made a walking motion with her fingers and said, “Buen Camino.” She repeated this touching ritual with each of us. Like saints of old doing good in lonely outposts for no earthly reward, she simply existed to love the stranger. Then there is Tomas, who has occupied a tiny abandoned village in the mountains near the Camino’s highest point and created, in an eclectic assemblage of flags, signs, sculptures and makeshift structures akin to outsider art, a haven for pilgrims seeking a tranquil respite by day, one of his 35 mattresses by night, or shelter from the storm anytime it’s needed. Whenever he sees a pilgrim approaching, he rings a temple bell to greet and bless them. If a cloud covers the mountain with fog and darkness, he rings the bell to guide lost pilgrims to his safe haven. This is his life: to live as a hermit in order to serve the pilgrim. Finally, on a shady trail through a eucalyptus grove yesterday, I saw a young man kneeling in the dust to pray before a wayside cross. I don’t know his name or his story, but the evident depth of his devotion reminded me how serious a matter the Camino can be. And now I am at the outer edge of Santiago, in a quiet albergue with very few occupants. Most pilgrims who get this far simply continue on to the great cathedral less than an hour’s walk from here. But I didn’t want to drag myself to the finish late in the day, wearied and worn by ten miles of walking. 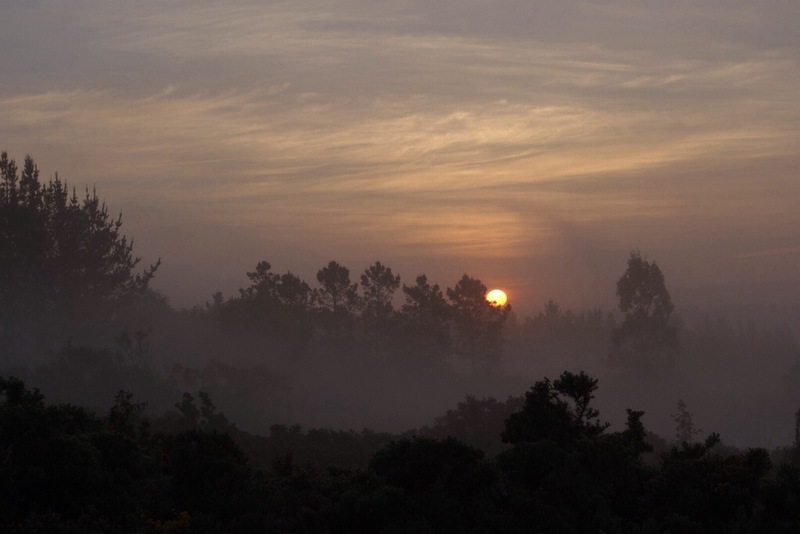 I want to arrive fresh and renewed, to finish my Camino in the light of the rising sun on the day of Resurrection. So like Jacob of old, who camped just short of his destination in order to collect himself for the morrow’s big encounter, I shall rest and reflect and – who knows? – maybe wrestle with angels till daybreak. Yesterday morning, having walked a couple of hours as the rising sun burned away the fog, I stopped for breakfast in a serene cafe setting of lawn and trees. Soon David, an Irishman I bunked with a couple of weeks ago, came by, followed by an American (from Seattle!) who slammed his pack down and whined loudly, “Why did they make us take that pissy little trail when we could have stayed on the road?” He was referring to a steep shortcut that took pilgrims safely off a blind curve. It wasn’t long, but the footing was tricky. 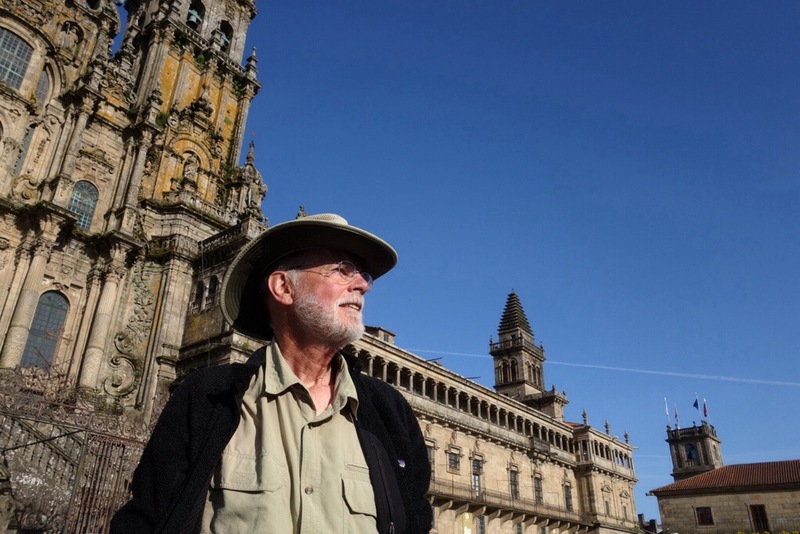 David replied softly, “The Camino wants you to go its way, not your own.” And I chimed in, “The Camino is all about surrender.” The poor man had no reply. He was a newbie, one of the many who had only recently joined the trail to rack up the minimum 100 final kilometers required to earn a “Compostela” – the treasured certificate of completion. He hadn’t yet put in enough mileage to have the willfulness walked out of him. Speaking of which, I took a fall today. After a month without a mishap, now but a day’s walk from Santiago, I tripped on a root and did a spectacular face plant: bloody nose, minor nicks and scratches, and broken sunglasses. A French woman and an American student stopped to help, and walked with me to the next town, where I found a room and cleaned up. 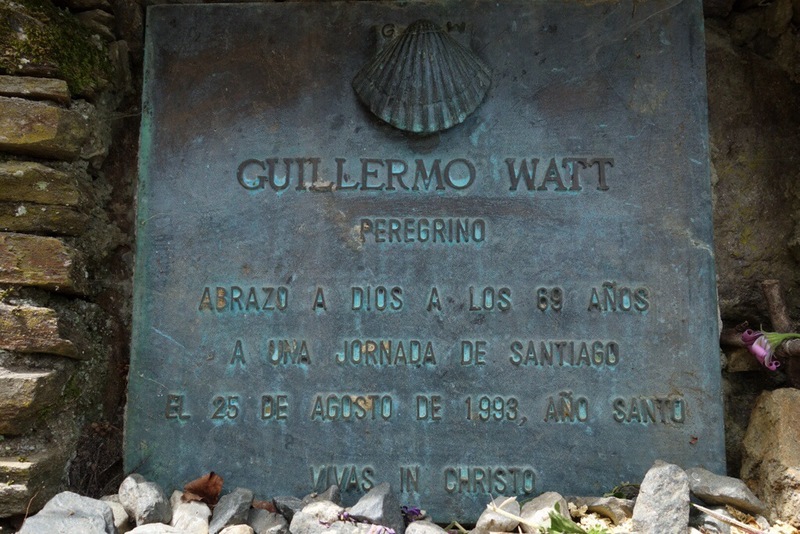 I am fine, but it was odd that this occurred only minutes after I had paused at a touching trailside memorial for Guillermo Watt, a man exactly my age who had died there in 1993, just one day short of completing his pilgrimage. These final stretches of walking have been especially lovely, reminiscent of the English countryside of the Romantics – low stone walls dividing leaf-shaded paths from sunny green pastures, as wandering clouds drift lazily overhead. While the degree of my spiritual surrender to the Camino may be difficult to measure, I have wholly surrendered to its beauty. 58 miles – nearly 100 kilometers – in three days, with a wearying amount of elevation gain and loss, have made this portion the most physically demanding portion of my Camino. But whenever my spirit slackened, or knees complained, I only had to look around me. What splendid countryside! What fortunate walking! On the first long day, I began at sunrise in sight of snowy peaks, navigated (barely) a busy city, traversed a wide plain to the rolling wine country of El Bierzo, and finished in the picturesque river town of Villafranca. The next day took me up and down, then up again, steep-sided ridges of red and white flowering shrubs and the fresh spring green of chestnut groves. After the last hard climb, I lay down in a high meadow of buttercups and daisies to read Wordsworth’s lines about “the calm existence that is mine when I am worthy of myself.” A few more steps put me in the Celtic region of Galicia, land of stone houses, damp weather, and lingering traces of premodern spirituality and culture. I spent the night in the quaint mountaintop village of O’Cebreiro. 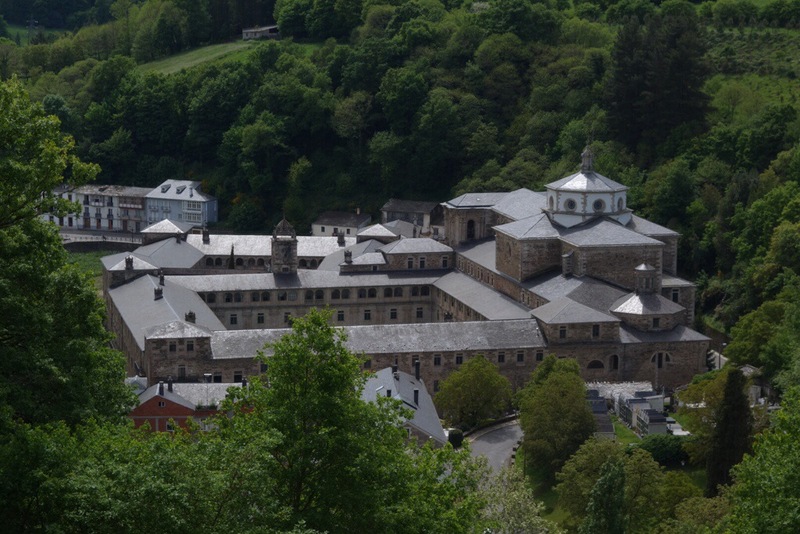 My third 20 mile day was a charming medley of rivers , woods and birdsong, until I reached the monastery of Samos, one of the oldest and largest in the western world. Situated in an isolated valley reminiscent of Shangri-La, the imposing collection of buildings, plain and austere on the outside, contains a magnificent Baroque church, an immense garden cloister in the classical style and, covering three long walls of an upper portico, a 1960 mural of obscure saintly miracles. Its wild, unsettling intensity seemed to contradict the ideal of monastic balance, as if the community’s shadow side had been somehow consigned to these painted walls, a la Dorian Gray. In any case, the monks, sans shadow, sang a lovely vespers to restore the body and soul of weary pilgrims. And tonight, the third Tuesday of Easter, I am writing in a “casa rural,” a traditional stone farmhouse accommodation where I hung my laundry among grazing cows and am enjoying a spacious bedroom overlooking the chickens – a restful change from last night’s monastic dorm with 40 people. Over dinner with the other three guests in the house, all of them Americans who have worked for good in Third World countries, we immediately discovered a number of remarkable connections between us. With the rapport, even intimacy, of old friends, we spent the next three hours conversing about the meaning of our own Caminos. When I had trudged an extra two kilometers past the last town, up a steep hill in the middle of nowhere, hoping I could just find a bed at this place, I did not know I was being led to such a holy meeting, such a convergence of thoughtful and passionate souls. Grace happens. 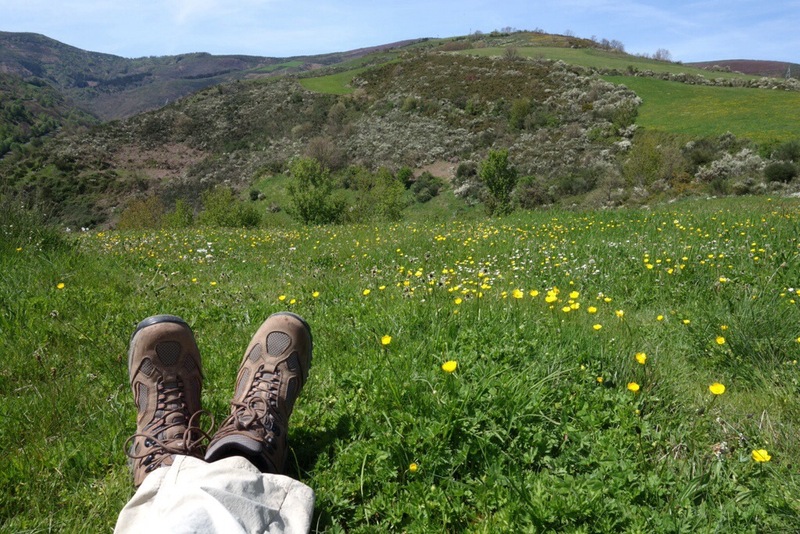 Halfway to Santiago, a Camino friend was feeling some pain and discouragement on a particularly demanding stretch. But then he saw a handwritten sign: “Don’t give up before the miracle.” As far as I know, he is still on the Camino, along with his vision-impaired son, though they have fallen a few days behind me. May they find, as I have, that there may be more than one miracle along this Way. Tonight was one of them. As I myself draw near the goal, now less than 100 kilometers from Santiago, my thoughts turn to those who were unable to complete their intended journey. I have seen many memorials on the Camino to pilgrims who died at a particular spot. These crosses, cairns and fading photographs have signified the precariousness of every journey, the preciousness of each day we are given to walk in beauty. I have also shared the path with pilgrims who had to drop out due to physical problems. In Dante’s expressive image, their hearts reached for Santiago, but their bones delayed. One of these was Monty, a devout Catholic from Nebraska, who walked with severe foot pain every day for two weeks until he finally had to give up. He always started before dawn, while the rest of us slept, so he could match our progress at a slower pace. Monty is one of my Camino heroes, not only for his determination and grit, but for the way he valued the community he had fallen in with. He suffered in order to maintain the connection. “With sleep apnea, asthma, one artificial knee, and one arthritic knee, I knew from the beginning that my chances of walking the enire distance were slim. I could have started someplace else, but then I wouldn’t have met you. Each of you, in your own way, made my Camino special, and I am grateful. It was never about the paper, and if I finished by train I still walked about 200 miles. 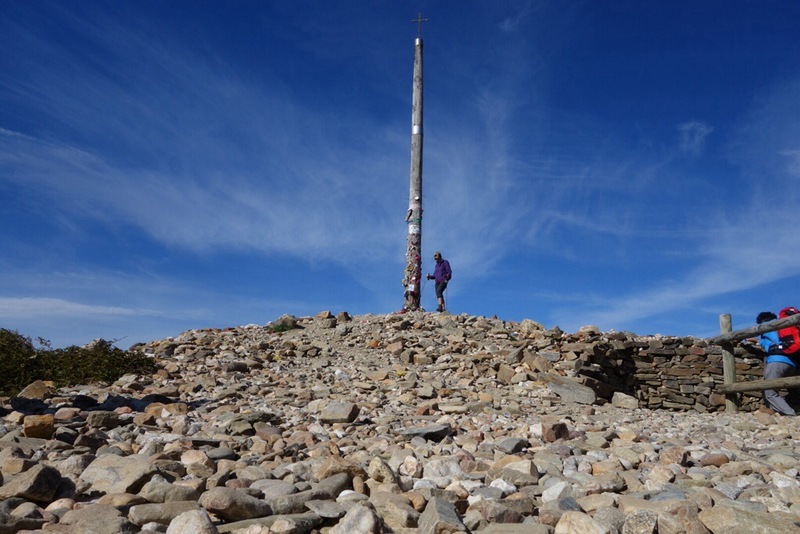 I climbed the mountain this morning to add my stone to the great pile left by pilgrims past at the foot of the Cruz de Ferro. Everyone was taking a turn on top of the rocks, striking a pose for the camera. Someone offered to take my picture, but I declined. To me the ritual of offering was not a matter of the public self, but of disappearing, at least for a moment, into something larger. 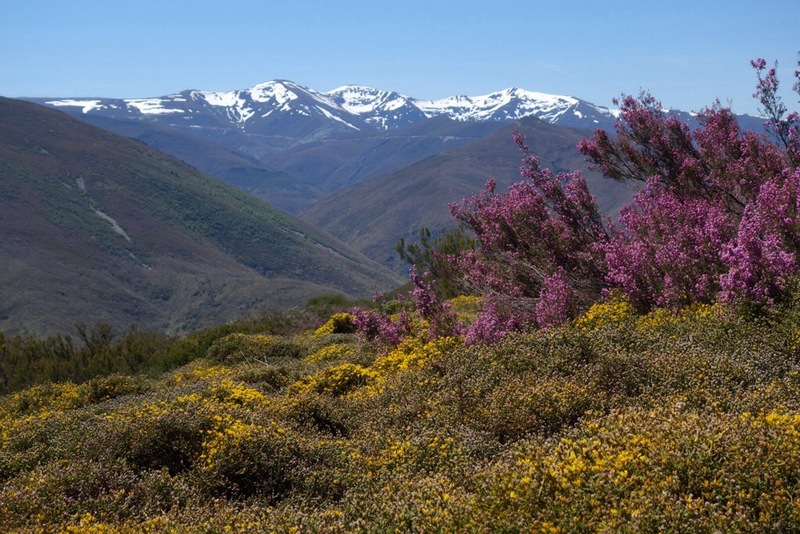 And from there it was the most strikingly beautiful day of the Camino so far – brilliant light, a profusion of spring color, a backdrop of snowy peaks, and grand views of where I have been and where I am headed.